From bottom left: Dr. Sue Kulp, member of the Delaware County Reading Council and Principal of Edgewood Elementary School; Marcia DeSantis, Edgewood Elementary School Reading Specialist; Brian Dillon, Delaware County Libraries; Cathy Bittle, Director of Delaware County Libraries; Councilman Kevin Madden; Janis Stubbs, Delaware County Libraries; Kristin Suda, Delaware County Libraries; and Cherri Crow, Delaware County Libraries. From top left: Councilman Brian Zidek, Vice Chair Colleen Morrone, Councilman Mike Culp and Chairman John McBlain. 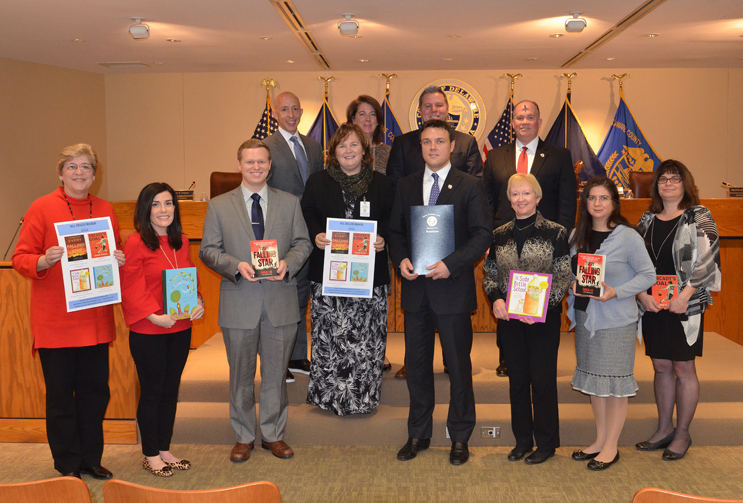 Delaware County Council is once again partnering with the Delaware County Reading Council and the Delaware County Library System to urge young people and adults to read one common book and to discuss it among friends in organized book clubs or at library programs. The Delaware County Reading Council was organized in 1963 and meets monthly to discuss ways to promote literacy.